What if everything you thought was real in your life…wasn’t? That’s the reality that main character, Josie Harper, is hit with. A life that she thought was perfectly normal was all orchestrated from the day she was born. Not only is she hit with this realization, she’s also found out that her “safe” life, isn’t quite so safe. She has people from a secret organization that are hunting her down like prey, wanting her dead. And the people that she thought she knew and trusted…well, that’s not quite so clear anymore. Who can she trust? What is the truth? And why is she so important that people want her dead? Anomaly by Tonya Kuper was a read that really had me thinking. A seventeen year old girl has all this untapped power. Josie is an Anomaly. Not only does she have the ability to “push” things into existence, but she can also “Retract” things (make them disappear)! Very x-men. But as we progress through the story, is appears that Josie’s powers are even stronger than she, or anyone else, really imagined. As she gets stronger, we see just how powerful she could be…and I’m betting that we haven’t even seen half of what she can do. The problem I have with some sci-fi reads is that ability to keep up with what’s happening. Sometimes, I have a difficult time grasping what the author is offering. And that’s what I found with Anomaly. Midway through and to the end, I was very caught up with what exactly was happening. I found myself a little lost in the beginning, especially with having to “learn” new words and their meanings. What I really enjoyed about Anomaly by Tonya Kuper was the last quarter of the book. It was jam packed with action. Powers were going off all over the place, and it was quite exciting! On the other hand, the beginning dragged a bit for my liking, and I wished that there was more action. I understand that Josie is being hunted and is in danger…and I wish that more of that danger was shown in the beginning. I understand that the first book is usually all backstory…explaining how things came to where they are. How people that we meet in the book fit into everything. But the knowledge that danger was around every corner is so exciting to me, and that rarely happened. I loved the character of Reid. A tortured soul who has had to live with a dark secret. And, dang, he is described as hella hawt. The chemistry between him and Josie was cute, and I felt like there was an insta-love vibe that was going to happen…but yay backstory. Just knowing the history between Josie and Reid made their connection all that more intriguing and I very much ship it. What bothered me a little was the use of the “nerdy” language. Yes, I understand that Josie is a nerd…loves her Star Wars, Big Bang Theory, Star Trek, etc. But I found myself getting irritated by the many references used throughout the book, to get the point across that she’s a nerd. It came to a point where I was like “enough already”. 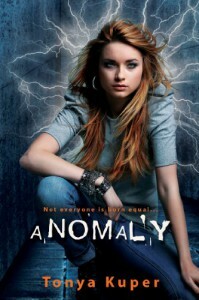 Apart from that, all in all, I really did enjoy the story in Anomaly by Tonya Kuper. I love that the main character is a strong, smart, “nerdy”, female character. I love that the male lead is flawed and fighting his own inner demons. I recommend this read to fans of sci-fi reads. Anomaly was a promising first book, and I’m looking forward in seeing where the author is planning to go with the story line.